Massachusetts-based Gatso USA will provide license-plate scanners to Oklahoma to catch uninsured drivers. Oklahoma has finalized a deal with a Massachusetts company to use license-plate scanners to catch uninsured drivers, and the firm expects to issue 20,000 citations a month starting as early as next year. The program, believed to be the first of its kind in the nation, involves setting up automated high-speed cameras on highways around the state to detect uninsured vehicles and mailing their owners a citation with a fine of $184, according to the District Attorneys Council. Gatso USA, a Beverly, Massachusetts-based company that specializes in red-light-running and speeding detection systems, will initially get $80, or 43 percent, of each fine. Its cut will decrease to $74 after two years and $68 after five years, according to a contract approved by the state after months of legal review and negotiation. The company could expect to bring in $1.6 million a month, or $19 million a year, if the 20,000 citations are issued monthly. Gatso is a subsidiary of a Dutch company. Drivers who pay the fees will avoid having a charge of driving without insurance on their permanent record. When the first citations will be issued remains unclear. Gatso executives were unavailable for an interview. The purpose of the Uninsured Vehicle Enforcement Diversion Program, approved by the state Legislature in 2016, is to reduce the high number of uninsured motorists in Oklahoma. A 2015 Pew Charitable Trusts survey found that 26 percent of all drivers in the state are uninsured – the highest rate in the nation – which can push up insurance premiums and hit-and-run accidents. But another incentive underlies the program. It will be overseen by the District Attorneys Council rather than law enforcement, and the state’s 27 district attorneys’ offices are expected to receive millions of dollars in citation revenue a year, although no estimates were provided. District attorneys have complained that their revenue sources are diminishing because of state budget cuts and the drop in bounced-check fines. Before citations are issued, technical details need to be ironed out, and testing will be done. Ultimately, both mobile and fixed cameras will be placed around the state. There are no startup costs to state government, and Gatso will handle a public-awareness campaign that will precede implementation of the program. Details gleaned from public records, including the contract and Gatso’s proposal, shed further light on what Oklahomans can expect. The cameras will be deployed on a small scale initially. Vehicles with scanners will be sent into the Oklahoma City and Tulsa areas to get traffic counts, gauge noncompliance and gather data on the first locations for cameras. Within six months, Oklahoma County, Tulsa County and 13 other counties in those areas will be mapped and studied, with the cameras in place, the company estimates. The mobile enforcement units will then drive to other parts of the state, looking for high-volume areas of noncompliance that could be potential spots for camera installation. Within the first year of the program, about 26 cameras will be in place throughout the two metro areas. Another 10 cameras will be installed throughout the rest of the state. Additionally, there will be two or three mobile enforcement units mounted on vehicles, bringing the total to nearly 40 cameras statewide. Even so, the number of violations is expected to be highest during the program’s initial months. The company recommends that the council limit citations to 5,000 a day during the first three months of the program. After the program is fully in place, the company estimates that each camera will capture 15 to 20 violations a day, or about 20,000 a month. The cameras will scan license plates of vehicles, comparing them against a database of insured vehicles. Owners of uninsured vehicles will get citations in the mail, regardless of who the driver was at the time the scanner caught them. Citations will come from the company, not district attorneys. If vehicle owners don’t pay the citations, the information gets forwarded to district attorneys for potential prosecution. Those paying and getting insurance also avoid other penalties that would come from a traditional citation, like a license suspension, said Trent Baggett, executive coordinator of the District Attorneys Council. “All we want is for people to get their insurance,” he said. Vehicle owners who receive inaccurate citations can avoid payment by showing that they were insured at the time they were scanned. Baggett said the five-member council will determine how the funding from citations from the scanners will be dispersed among district attorneys. While the number of cameras will be relatively low, they will be moved around the state. 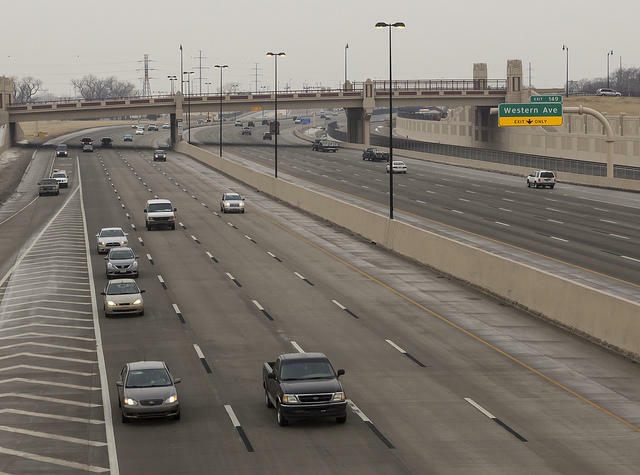 Officials are focusing more on high-traffic areas where more vehicle plates can be scanned. Kevin Buchanan, president of the council and the district attorney for Washington and Nowata counties in northeastern Oklahoma, said the program will benefit the state as a whole as scanners rotate to different areas. “Each of our districts is going to be able to have coverage through this program as it goes on,” he said. The enforcement program sends $20 from each citation directly to the District Attorneys Council for administrative purposes. Of the $20, $5 goes toward processing costs for payments, $10 toward operating and maintaining the program’s insurance verification database, and $5 to a state pension fund. The $84 left over after the vendor’s cut will also go to the council, yielding up to $20.2 million a year, but how that will be allocated hasn’t been decided. District attorneys will be watching to see if revenue from the program covers the funding losses they’ve faced. Baggett said as of now, the potential revenue from the citations is unknown. But the data is intended to be kept secure and will be deleted once the scanners determine a vehicle has insurance, he said. Gatso says in its proposal that none of its data has ever been altered or hacked. Gatso’s business focuses on speed and red-light enforcement, but its roadside camera technology is likely to apply easily to catching uninsured drivers. The key is connecting the system to a continually updated database with insured vehicle owners. Oklahoma is one of about two dozen states that do not allow cameras for detecting speeders or red-light runners, according to the Insurance Institute for Highway Safety. Oklahoma does operate scanners on toll roads to catch drivers who use the tollways without paying. Long-term, the technology has the potential to be harnessed for law enforcement purposes beyond insurance enforcement, such as Amber and Silver alerts, Baggett said. That would require the Legislature to change state law, however. Baggett said he doesn’t expect that to happen any time soon, as officials will focus on the rollout of the insurance program. This story was updated Nov. 16 with additional financial figures and context on Oklahoma laws regarding roadside enforcement cameras.